Atlanta is Georgia’s largest city and the state capital. 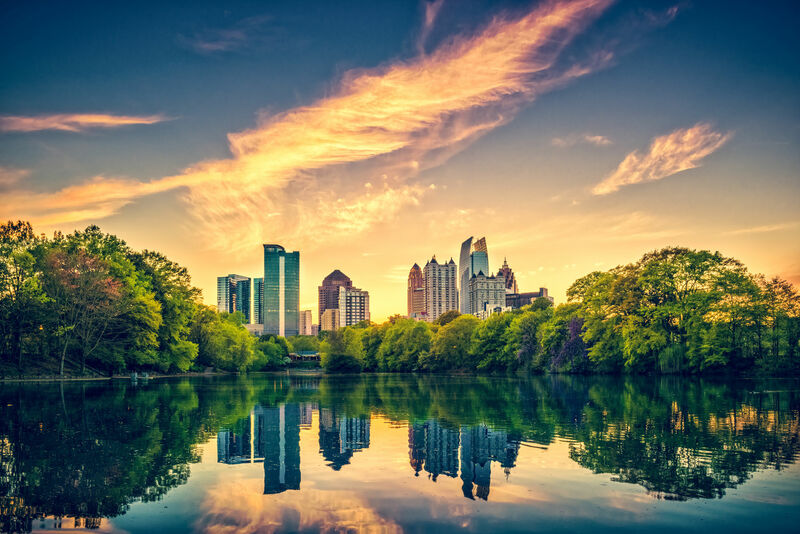 As the “Empire City of the South,” Atlanta has developed into a major metropolis that uniquely combines the Old South’s grace and gentility with the New South’s modernity and commerce. The location for both “Gone with the Wind” and “Driving Miss Daisy,” Atlanta has a fascinating history that set the stage for becoming one of America’s most frequently visited destinations. Atlanta is a bustling headquarters for corporations, industry, manufacturing, finance, and media. The city’s motto is “Resurgens” (Latin for “Rising Again”), as a tribute to being reborn into prosperity after burning to the ground in the Civil War. The city offers a wide variety of family-themed places for kids of all ages to enjoy. The most popular of these is the Georgia Aquarium, the world’s largest indoor aquarium. Don’t miss the World of Coca-Cola, a two-story memorabilia gallery and interactive museum showcasing everything about the most popular brand of beverage on earth, then watch a live assembly line bottling Coca-Cola, and sample your own selection of Coke drinks and flavors. Martin Luther King was an Atlanta native. The National Center for Civil and Human Rights opened in 2014, but Atlanta’s most visited civil rights site continues to be the Ebenezer Baptist Church, his home church and final resting place.Atlanta’s main tourist district, in the downtown neighborhoods around Centennial Olympic Park, provides elegant shopping, cultured museums, beautiful gardens, thriving nightlife, eclectic architecture, premier festivals, and world-class performing arts. In Atlanta, tea is always sweet and peach trees are a common sight. This grand city has an abundance to offer, whether traveling for business or leisure. DID YOU KNOW? America’s first gold rush began in 1828, in the Peach State’s Appalachian foothills just a bit northeast of present-day Atlanta. The dome of the Georgia State Capitol is covered in a glittering layer of gold that was mined locally. A statue of Miss Freedom, also known as the Goddess of Liberty, stands proudly atop Atlanta’s golden dome. Atlanta / Dekalb Peachtree, GA – PDK – Signature Flight Support: no less than 30 minutes prior to scheduled departure. If a ticketed passenger arrives at a ticket counter and no agent is available, the passenger should call Carrier’s Customer Service Center at 800-329-0485 for assistance.